We make sure all our patients feel welcome, safe, and taken care of. Our expert team, led by respected endodontic specialists Dr. Eric Barnhurst and Dr. Christopher Beus, includes an experienced endodontic staff. As members of the American Association of Endodontists, we provide the highest standard of professional care in a friendly, comfortable environment. Your initial appointment will consist of a consultation explaining your diagnosis and treatment options. In most cases consultation and treatment can be performed the same day. However, a complex medical history or treatment plan will require an evaluation and a second appointment to provide treatment on another day. Your treatment referral slip and any x-rays if applicable, along with a list of medications you are presently taking. If you have dental insurance, bring the necessary information with you to your appointment. We will need your insurance company name, claims address and group number. This is information we can usually get from your insurance card. This will save time and allow us to help you process any claims. Important: A parent or guardian must accompany all patients under the age of 18 at the consultation. If your dentist or physician has taken x-rays, you may request that they forward them to our office. We will take any additional x-rays that are necessary for your endodontic treatment. In early 2012, Colorado West Endodontics became among the first to add a high-resolution 3D cone beam computed tomography (CBCT) extraoral imaging system to its office, revolutionizing patient treatment. 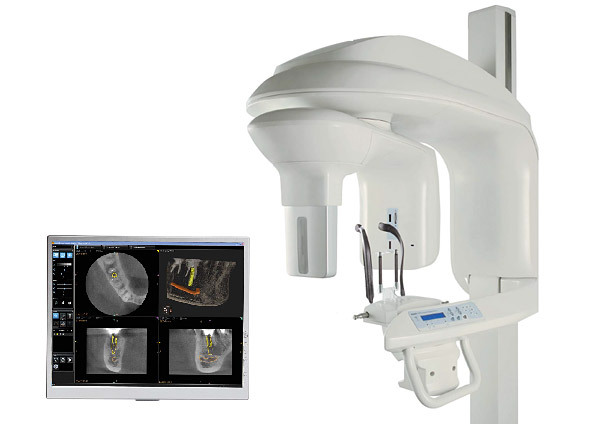 The state-of-the art Carestream 8100 3D system captures high-quality images allowing for a wider range of diagnosis and treatment, all while using less radiation. We offer this imaging modality at both of our practice locations. This breakthrough technology provides unprecedented x-ray views of the oral cavity helping practitioners diagnose more accurately and treat with confidence. The CBCT allows 3D assessment of oral lesions, canal morphology, retreatment cases, root fractures, implants, and much more. We gladly accept other office's patients for scans; we will send back the images on a disc for their diagnosis and records. For your convenience we accept Visa, MasterCard and Discover. We deliver the finest care at the most reasonable cost to our patients, therefore payment is due at the time service is rendered. If you have questions regarding your account, please contact us at (970) 242-9088. Many times, a simple telephone call will clear any misunderstandings. We require that payment for services be made at the time of treatment. Patients with insurance should realize that your insurance will cover a percentage of treatment, however, the patient is ultimately responsible for the entire fee for the service provided. Due to the size of our office, we are unable to set up and administer payment arrangements, therefore, we do not accept payments. All fees are due at the time the service is performed. We do offer an option with Care Credit to set up a six-month interest free loan for dental services. THESE ARRANGEMENTS MUST BE MADE BEFORE THE APPOINTMENT. If you are interested in this option you can either contact our office at (970) 242-9088 or www.carecredit.com to apply. The patient is ultimately responsible for the entire fee for services provided. Insurance may cover a percentage of the treatment. Our office contacts your insurance company to estimate a co-pay. This is not a guarantee of payment from your insurance company; it is only an estimate. Only a pre-authorization of treatment will guarantee payment. Once insurance pays, any remaining balance is the responsibility of the patient. If you would like our office to submit a pre-authorization to your insurance company, please let us know and we will be glad to do so. Be aware pre-authorizations typically take three to six weeks to process. We are not "providers" for most insurance companies. Some insurance companies pay the patient directly; in this case, we collect payment at the time of service.